“Here’s What’s Up” is the Longo Planetarium’s weekly link to some fascinating astronomical topic. This is an archive of all the items we have posted. Keep up with this by liking the CCM Facebook page at www.facebook.com/countycollegeofmorris! December 18, 2018 -GPS. We all depend on it to get us where we need to go. Emergency services have come to depend on it for a whole group of reasons. Well, it is about to get a huge upgrade. Today, NASA launches the first of the next generation of GPS, which will be three times more accurate than the current system, and has sophisticated encryption. The machine was built by Lockheed-Martin, and will launch in a SpaceX rocket. This is the first of 32 satellites, but soon, you’ll be able to get to your destination faster and easier! April 11, 2016 – If you were to go into space, would you be willing to live in a balloon? Seems a little scary, but the BEAM (Bigelow Expandable Activity Module) is just that! Sent up by the SpaceX, being tested over the next 2 years, layered fabric, strong as steel, and lightweight, it could provide easy ways to expand the functional area of the International Space Station, and pave the way for the possibility of sending humans to Mars. February 29, 2016 – We are stuck in our island of 200 billion stars called the Milky Way. How can we map this galaxy we are stuck inside? In an unusual way — map the DUST! The APEX telescope shows us the disc of the galaxy in unprecedented detail. January 11, 2016 – We bid goodbye to a legend today. David Bowie inspired music, as well as folks to look forward to the possibility of science and imagination. Evidence of this: Canadian astronaut Chris Hadfield, aboard the International Space Station, produced the first music video in space, playing Bowie’s “Space Oddity”. It is one of the most watched internet videos, and spoken of by Bowie himself as the most beautiful, moving, and honest version of his song ever produced. September 28, 2015 – The MAGIC returns! Back by popular demand is Longo Planetairum’s own “Astrono-Magic for Muggles” show! On Saturday, October 24, at 3:00 pm and 5:00 pm we will be inviting Wizards and Muggles alike to look at the amazing astronomy that weaves it’s way through the Harry Potter universe. Tickets are $10 each. Call 973-328-5076 soon for reservations — these shows will surely sell out quickly! May 11, 2015 – Our universe just appeared a little larger — A galaxy further away than any other previously known has been discovered. The light we see from here on Earth today left this galaxy over 13 billion years ago! April 13, 2015 – As the Dawn spacecraft continues to study Ceres, and we await glorious images of its surface, NASA has released an interactive map of the Dawn spacecraft’s first destination, Vesta. March 30, 2015 – One of the most haunting and beautiful images has just been returned from Mars. 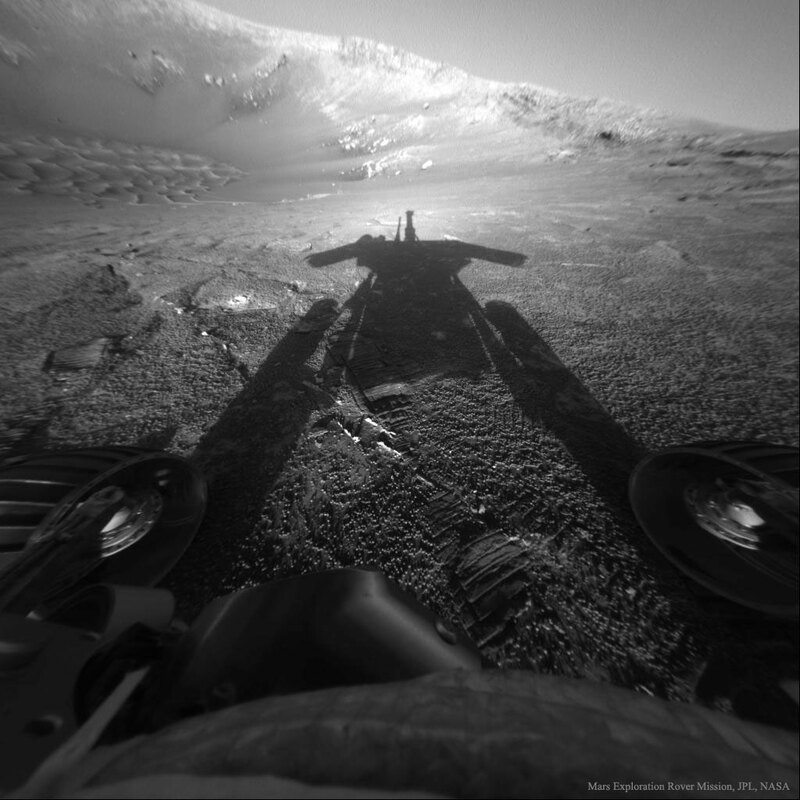 The Opportunity Rover had the ‘opportunity’ to take a self portrait in shadow. Eerie mountains in the distance, and a perfect shadow in the foreground. There are lots of audio clips from scientists to illuminate tricky concepts. November 10, 2014 – Rosetta spacecraft update! This Wednesday, November 12, we may be marking a big milestone in space exploration as the Philae probe detaches from Rosetta and tries to impale itself onto the surface of comet 67P. October 20, 2014 – Yesterday, comet Siding Spring passed remarkably close (within 82,000 miles) to the surface of Mars. It gave six Mars-based spacecraft, and some deep-space observing telescopes, a unique, surprise opportunity to observe the nucleus, coma, and tail of a comet up close! September 15, 2014 – The Venus Express spacecraft is currently surfing across the atmosphere of our sister planet! After 8 years of studying the planet from afar, it has begun dipping down close enough to the planet to sort of skip across Venus’ thick cloud layers. April 21, 2014 -Let’s take a close look at the moon! The Lunar Reconnaissance Orbiter has been collecting high-resolution images of the northern hemisphere of the moon. Zoom in to amazing tiny craters and rocks on the surface of the moon at ultra-high definition at http://lroc.sese.asu.edu/gigapan/. March 31, 2014 – For the last few months, we have been featuring links related to our Solar System. Our little neighborhood is actually unimaginably vast — it’s difficult to describe its size and scale. However, this little web page makes a fairly decent attempt, “If the Moon Were Only 1 Pixel”:http://joshworth.com/dev/pixelspace/pixelspace_solarsystem.html. November 25, 2013 – We continue our exploration of the Asteroid Belt as we visit one of the best resources for educators and hobbyists: The NASA Discovery “Small Worlds” site. There is plenty of news and information, and tons of activities for the classroom, as well as at home to keep our young scientists busy on those days off from school! Check out all the great info, images, and activities at http://discovery.nasa.gov/smallworlds.cfml. November 18, 2013 – We continue to explore the Asteroid Belt by checking on the Dawn spacecraft. Launched back in 2007, this spacecraft has visited Asteroid Vesta during 2011 and 2012, and will continue on to Asteroid Ceres, and will become a permanent satellite of this dwarf planet in 2015. Follow the fascinating facts we’ve found, and what we hope to find in the future at: http://dawn.jpl.nasa.gov/. November 4, 2013 – Mars has two potato-shaped moons, which are worth further investigation. They may be pit-stops on our way to human of exploration of Mars! Tons of information about these curious moons are available here:http://www.space.com/20413-phobos-deimos-mars-moons.html. October 9, 2013 – NASA’s Juno spacecraft, launched back in August 2011, will be swinging back home TODAY, (Oct. 9) before continuing it’s journey to Jupiter! It will be stealing a tiny bit of Earth’s orbital momentum in order to get the boost it needs to reach the gas giant in 2016. Amateur radio operators (HAMs) are invited to say “Hi” to Juno by transmitting Morse code. August 19, 2013 – Many years ago, the web site http://nineplanets.org brought together the most comprehensive collection of facts and mythology related to the planets in the Solar System. Even though the number of planets has dropped to eight, they kept their classic name, as well as continuing to update the web site with some of the best information and images of our neighborhood of space! August 6, 2013 – For 20 years, the Hubble Space Telescope has dazzled us with remarkable images of astronomical wonders. To mark this occasion, you can look back at some the highlights, and even send your very own personal ‘happy birthday’ message up to the satellite itself! http://www.google.com/earth/explore/showcase/hubble20th.html. May 13, 2013 – For the finest, free, printable star charts around, StarMaps is a wonderful website. They provide monthly guides to our skies, with detailed constellations, as well as any special astronomical events you can see with telescopes, binoculars, or just the naked eye. Print out a new guide every month at: http://skymaps.com/downloads.html. April 22, 2013: We’re all hoping for clear skies tonight to catch a glimpse of the Lyrid Meteor shower, whose peak is tonight! An early large moon may wash out the skies after sunset, so the best time for a chance to see a shooting star will be the last few hours before sunrise (3 AM – 6 AM). This is not traditionally a large meteor shower, but even seeing a couple streaks across the sky is a thrill. More information on the history or this shower and viewing tips are here:http://earthsky.org/tonight/lyrid-meteors-increase-while-moon-waxes-throughout-weekend. March 25, 2013: “Mars in a Minute” is a nifty, simple glimpse at how we communicate, and lose communication with the rovers on Mars.